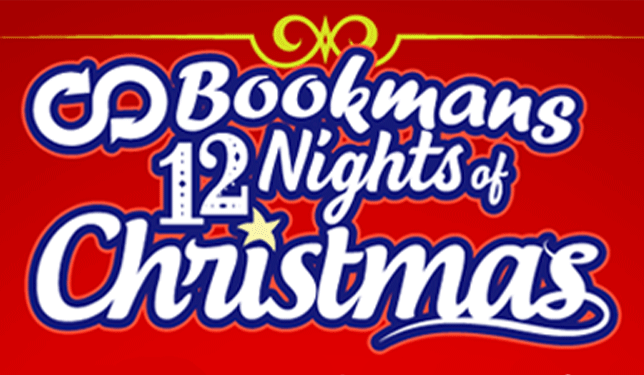 Bookmans has something amazing heading your way every night this week with our 12 Nights of Christmas Sale! It’s important to get something special for everyone on your holiday shopping list, and Bookmans is hoping to make gift shopping that much easier with our incredible 25% Off Sale! Each night from December 7th through December 18, Bookmans stores will have one type of item discounted 25% – and there’s never been a better time to stock up! It’s our way of saying thank you for shopping local this holiday season! All sale items during Bookmans 12 Nights of Christmas sale are discounted from 5 PM until 10 PM only. Individual items listed as on sale per day will only be on sale for that day only. No holds will be honored for discounts on sale items. Items already on hold prior to the sale date will not be discounted during the sale period. Additional discounts, coupons, and club membership discounts cannot be combined with the Bookmans 12 Nights of Christmas sale. Bookmans reserves the right to make changes to all sales as deemed necessary. The 2018 Summer Kids Events Continue! Month Of Merriment At Bookmans! will cookbooks be a category during your 12 nights of Christmas? Unfortunately, we are not revealing our 12 Nights of Christmas deals ahead of time, but we definitely wouldn’t be Bookmans if we didn’t put books on sale! Thank You!!! I’m soooooooooooo excited and can hardly wait!!!! Merry Christmas!!! !